Summary: Simon Snow is the worst Chosen One who's ever been chosen. That's what his roommate, Baz, says. And Baz might be evil and a vampire and a complete git, but he's probably right. Half the time, Simon can't even make his wand work, and the other half, he starts something on fire. His mentor's avoiding him, his girlfriend broke up with him, and there's a magic-eating monster running around, wearing Simon's face. Baz would be having a field day with all this, if he were here — it's their last year at the Watford School of Magicks, and Simon's infuriating nemesis didn't even bother to show up. I've been a huge fan of Rainbow Rowell since I read Eleanor & Park, and I eventually made my way to Fangirl and that became one of my favorite books of all time. So when I realized that Rowell was actually writing an entire novel based on the fanfiction story she references in her previous book, I was definitely a little bit curious, and totally excited. In Fangirl, Cath is famous for being so obsessed with the story of Simon Snow and his wizardry (similar to Harry Potter), to the point that she goes on to write fanfiction stories about the characters that helps her gain some fame in the geek world (which is, to be entirely honest, one of the best places to be). So I won this book in a giveaway, and I was excited to start it because I loved Fangirl. However, I was a bit uncertain if I was going to like it, being that I had seen/heard some mixed reviews of the book, and also being that unlike Fangirl, which was a YA contemporary novel, Carry On is entirely fantasy. (For those of you who have been around here for awhile, you'll come to learn that I am not the biggest fantasy fan around. The same goes for sci-fi books -- it's very rare that I find one that I'm 100% invested in and love. But I'm proud to report that this book captivated me from the beginning all the way to the epilogue -- all 500 pages of it! This was the first book I read since I've come back home for the summer, and let me just tell you, it was so nice to be able to sit and relax and focus on a story for hours on end with no interruptions. I couldn't tear myself away from this book and I think it was an excellent choice for the way to kick off summer vacation -- I'm so glad that it started with a book that I really enjoyed! There were a lot of things that I really liked about this book. 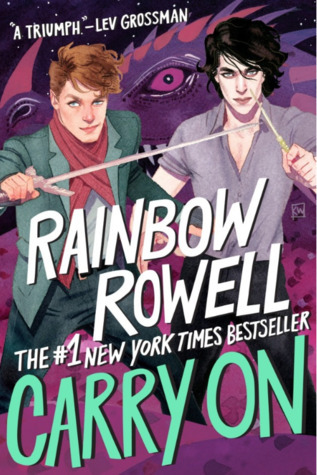 Since Carry On is supposed to be a fanfiction story that references previous events, I was worried that I was going to be confused or lost in the beginning, but Rowell does an excellent job of summing up previous events and the backstories of the characters without making everything drag on forever. In no time at all, I felt at home in the world of mages and I wasn't even the slightest bit lost. It was really easy to catch on to all of the backstories! As for the characters, I really liked Simon and Baz's relationship, even though it was pretty rocky at first. (For those of you who don't know, there are some spoilers ahead if you haven't read Fangirl, so please skip to the next paragraph if you don't want the story ruined for you!) I went into this book knowing that Simon and Baz were both gay and would end up falling for each other, because that was one of Cath's biggest shockers when writing her story in Fangirl. So it was interesting to see how they both interacted with one another in the beginning of the story, when Simon didn't know he was gay, had a girlfriend, and was sworn enemies with Baz. Things certainly change by the end of the story, let me tell you. I recommend sticking around, because it's super adorable (especially the epilogue!) and you'll be glad that you did. The story itself was really interesting, with a ton of plot twists, mysteries, and moments that made me gasp or laugh. I was particularly fond of one phrase in the book, in which Agatha admits that she spends all of the money that her parents give her on "tuition and tacos" -- AKA, my life story getting the spotlight in a Rainbow Rowell novel. You heard it here first, folks -- Agatha ends up living my life's dream. However, there were just a couple of things with the story that I wasn't too keen on. One of them is Agatha herself, because (spoilers ahead, skip to the next paragraph!) I didn't like how she just tucked her tail and ran when Simon and Baz and Penny needed her help. Not only did she run away from the situation, but she ran away to America, an entirely different continent, and tried to start her life over. I didn't like her much at all, because I felt that throughout the book she had a tendency to act entitled and pompous and definitely wasn't a good enough friend to any of them, even when she tried to be. So she was a character that I didn't really enjoy that much. The only other thing I can think of that I wasn't crazy about in regards to this book was the ending itself -- not the epilogue, but the part before it! (Spoilers incoming -- skip to the next paragraph!) I felt that there was no indication of the Mage being behind everything until it all happened at once. I know that that's how cliffhangers work, and it's supposed to surprise you, but I sort of felt that there was no indication there at all, almost as if the author needed to pin the problems on somebody and just chose the Mage randomly. I can be totally missing the mark here and may have just not noticed some of the earlier clues, but that's just how I felt when I got to that end scene -- I was totally taken aback. I don't even know what ended up happening with Ebb's brother. Where the heck did he go?! I loved this book so much!! It was so much fun seeing Rainbow Rowell do HP haha. I actually just bought this version of the cover - it's ridiculously beautiful - and I can't wait to re-read it!